The Buffalo Beauts have started off the first week of October 2018 with two final team practices before they head out onto the road. The Beauts are beginning the 2018-19 NWHL season in a game against the Connecticut Whale on Sunday Oct. 7, 2018. Traveling to the Whale’s home of Terry Conners Rink in the city of Stamford is the perfect opportunity for the Buffalo players to bond even more and continue to get to know one another. So while the Beauts are getting better acquainted with each other as teammates, we felt it would be enjoyable for fans to get to know one of the team’s most exciting new stars. Before Buffalo’s first practice of the week, THW met with goaltender Shannon Szabados. We had a little fun with her and posed to her a series of eight “fun fact” questions so that fans in Buffalo and around the NWHL can get to see what she’s about. Szabados enjoyed the questions and laughed over a few of them – we hope that you will too. 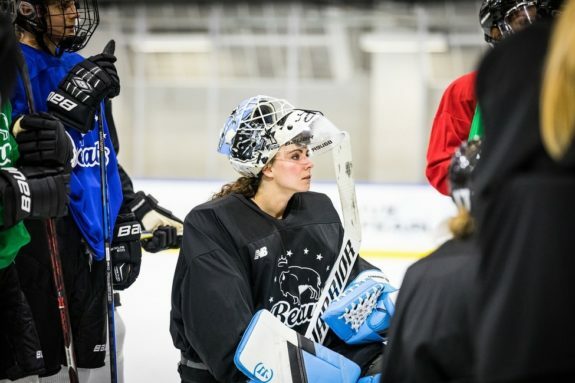 Shannon Szabados listens intently during a Buffalo Beauts practice (Photo Credit: Pat McCarthy). Before we get to the fun part though, let us talk a bit about what Buffalo can expect from their star-studded goalie this season and why she is hands-down the most elite goaltender in the league today. When the Beauts announced on Jun. 27, 2018 that they had signed Szabados, it meant that they had brought aboard a goaltender viewed by many as one of the best of all-time – if not the best – in the history of women’s hockey. She is a two-time Olympic gold medalist (Vancouver ’10, Sochi ’14) and a silver medalist (PyeongChang ’18) for Canada. Within those three Olympic tournaments Szabados posted an almost uncanny record of 8-1-0. The save percentages in each of her Olympic years have been staggering numbers of .980, .954 and .949 respectively, while her corresponding goals-against averages have been minuscule numbers of 0.33, 0.96, and 1.20. Szabados backstopped Canada in at least three games for each the 2010, 2014 and 2018 Winter Games. She was the recipient of the Best Goaltender Award for both the 2010 and 2018 tournaments. Adding onto Szabados’ Olympic achievements are the ones she has also achieved at IIHF Women’s World Championships. She has helped Canada bring home a gold medal in 2012 and a collection of silver medals from 2009, 2011, 2013 and 2017. Arguably Szabados’ finest performance at Women’s Worlds was just recently in 2017 in Plymouth, Michigan, USA. Canada narrowly lost out on gold in a 3-2 overtime defeat to the USA, but Szabados came away from the tournament with a .954 SV% and a 1.21 GAA and her fourth silver. 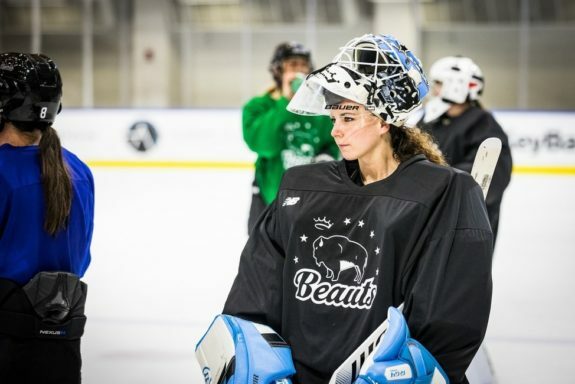 Shannon Szabados will likely make her NWHL regular season debut when the Buffalo Beauts take on the Connecticut Whale on Oct. 7, 2018 (Photo Credit: Pat McCarthy). If seeing these numbers and accomplishments excites you for watching Szabados make her NWHL debut, as well it should. It is important to note that she has never played women’s professional hockey before, although she has played professionally. Szabados played men’s hockey for parts of four seasons in the Southern Professional Hockey League (SPHL) for the Columbus Cottonmouths and the Peoria Rivermen. Early indications make it appear that Szabados will be Buffalo’s starting netminder. Both fellow Olympian Nicole Hensley and veteran Beaut Julia DiTondo are more than capable goalies, but it would be against Buffalo’s best interests to refrain from using Szabados’ talent as the team’s go-to. We have seen snippets of her in action thus far between the Beauts’ “Black vs. Blue” scrimmage and the squad’s exhibition game at Colgate University against the Whale. Neither game however was a true depiction of what Szabados is really capable of. For that we will need to see her in regular season play. Our advice to you is simple – be very excited to see Shannon Szabados play this season. Better yet, if you are a Beauts fan you are able to appreciate that she automatically bolsters the team’s ability to win the Isobel Cup at least tenfold. Szabados is everything that her résumé chalks her up to be. Be sure to get to an NWHL game this season so that you will have the pleasure and the privilege of seeing one of the very best at her craft give a live performance. Buffalo Beauts goalie Shannon Szabados has won two Olympic gold medals and one silver as a member of Canada’s Women’s National Team (Photo Credit: Pat McCarthy). 1. If you were the GM of a women’s hockey team, what player past or present would you sign first and why? 2. What’s your favorite hockey movie? 3. What is your favorite board game to play? 4. What would be the funniest or strangest save you have ever made? 5. If you could recommend a book for someone to read what would it be? 6. What goalie’s mask have you always liked or admired? 7. Best compliment a youngster has ever given you? 8. Favorite place in Buffalo that you’ve been to thus far?